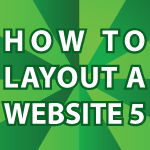 In this tutorial I finish up the How to Layout a Website Tutorial. If you missed the previous videos you can see them here at How to Layout a Website Pt 1, Pt 2, Pt 3 and Pt 4. Here I’ll finish making the template used by all the individual web pages. This time I create the template without any planning at all. I create the whole page completely out of my head. In the end I think it looks really nice. In the next video tutorial I’ll turn this website into a WordPress Theme. I’ve already made WordPress Themes twice before. Check out my Easy WordPress Theme Tutorial, my WordPress News Theme for more information. SIR WHY THE MENU IS UNDER THE CONTENT OF THE CONTAINER??? HOW CAN I MAKE IT OVER THE CONTENT?? I watch a lot of video tutorials and you are one of the best. So thanks and keep up the good work. Thank you. I’m glad you like them. I do my best to make them useful and quick. could you please answer my question from this video. It is about the href link for the menu. I am currently immersing myself in Java, HTML, CSS, and Java script. I have been learning with books and ramming it home with your great tutorials. Thank you very much for taking the time to say you like my videos 🙂 I appreciate that. I completely understand not wanting to share your personal information with the world. That is why my site will never be subscription based. Sir, am the newcomer on your page,coding is the problem to me,but through this way of teaching i convinced to follow your lessons.and i hope ‘ll master them to make own applications. You are fantastic in explaining the subject and so to the point. I would like to make a website in Web 2, so that the visitors can login and add their own text and pictures in a form to offer their goods and services. Or search for the records created by others. Could you please be kind enough to help me to know how to go about it or maybe create a video about this? Hey Derek! just wanted to say Hi, your tutorials are lifeblood of my studies, thanks!